Team of the Year is a selection of the top 11 footballers of 2017, including Ronaldo, Messi and Sergio Ramos. 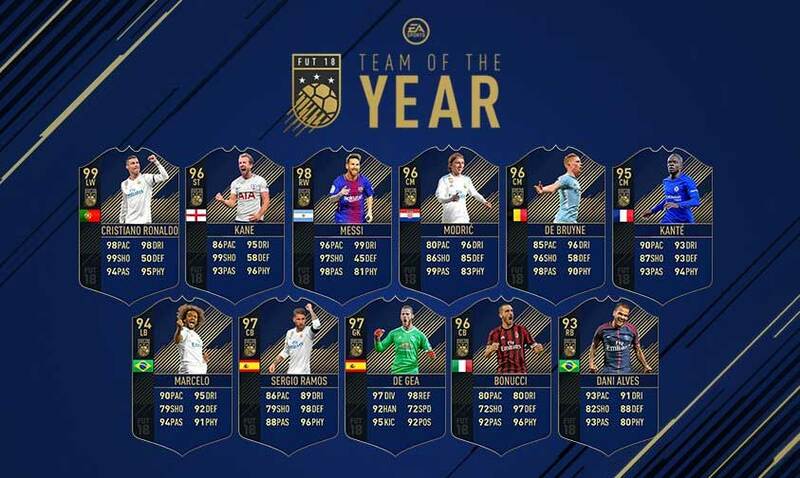 To celebrate this prestigious honour, FIFA Ultimate Team will have special Team of the Year In-Form items for the 11 winners, featuring some of the highest ratings of the year. Don’t miss out on these rare items, because they will only be available for a very limited time. To celebrate this special week, Electronic Arts will also release several SBC’s and promo packs. 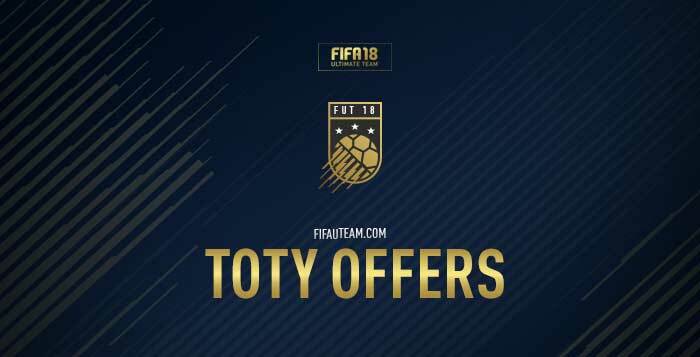 We will cover all these FIFA 18 TOTY offers on this page. What is the FIFA 18 TOTY Promotion? During the FIFA 18 TOTY event, Electronic Arts releases tons of promo packs and squad building challenges. Details on FIFA 18 TOTY offers will be updated below. EA knows that these big events are the perfect time to sell packs and for that reason they release the most wanted packs on the FUT 18 store. A selection of TOTY players will be available in packs with upgraded ratings as unique items. The overall ratings of these players cards are boosted aroud seven points, compared with their regular cards or the last IF card. You can learn more about the TOTY cards clicking here. Every single FIFA 18 event has its own squad building challenges and TOTY is no exception. To celebrate this time of the year, play the new SBCs with the chance to earn unique rewards. Hurry though, it’s only available for a limited time. 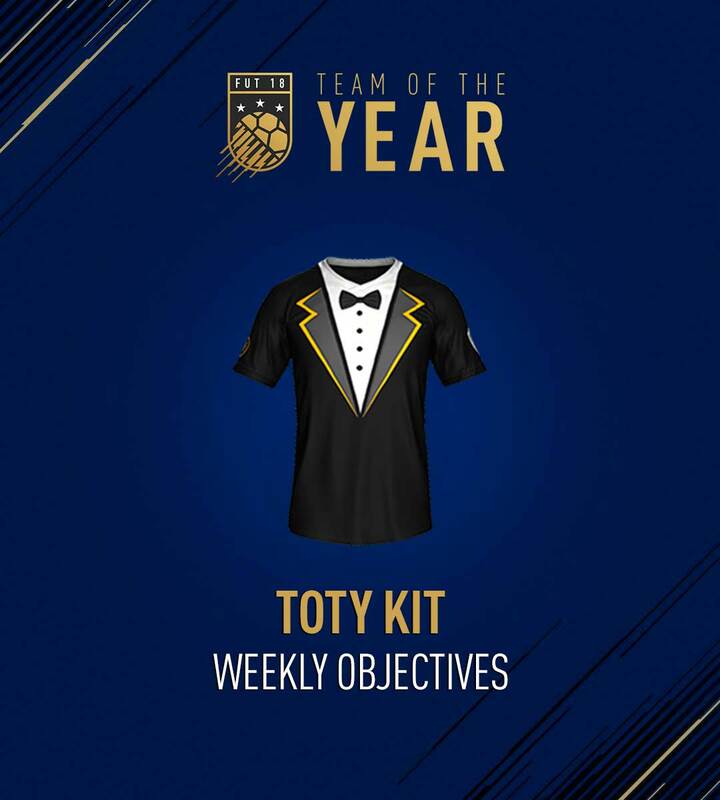 EA is offering you an exclusive TOTY kit, like they did last year. They are making the kit available via weekly objectives, just like they did with the previous events. All you have to do is to score 10 goals using first-time shots during this week in any FUT game mode. An exclusive kit for who completes ‘The Best Dressed’ specific challenge. During the TOTY event, players received a daily gift on their Companion or Web App. Pls guide me?kane TOTY price is 1780000 now,will the price reduce next days?what is your prediction? Should I buy this Rare player pack released now for 50k coins? I am afraid it would be wasting the coins I shared now and I don’t find any good players inside it!